You may not know this about me, but I have a thing for t-shirt guns. Many years ago, I decided that just handing t-shirts to people was boring. I figure ANYONE can hand someone a shirt, but the memorable ones deliver souvenirs with gusto. If someone hands you shirt, you won’t remember them. If I literally SHOOT one at you, I’ve got a shot at carving out some space in your gray matter. I have built t-shirt launchers out of PVC pipe that were powered by a probably horribly unsafe combination of air hose and fuel line attached to a huge air compressor that I’d roll out on the track at the fairgrounds, I’ve had little pneumatic deals powered by the cartridges that power air nailers for the construction industry, and then I stumbled on this beauty called the “Bleacher Reacher,” and my heart was stolen. It’s a purpose-built t-shirt launcher, designed to distribute freebies with all the explosive joy I could ever desire. Here’s the trouble: Curiosity. I’ve had various experiences over the years with that which killed the cat. I was curious once about what it would feel like to be shot by a muffin. 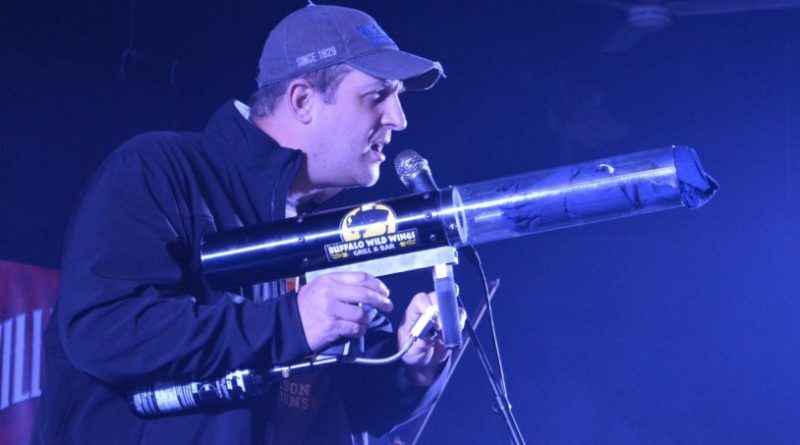 At our “Battle The Bigs” Charity Golf Scramble a couple years ago, I got to wondering if our t-shirt launcher could also launch a full can of beer. Answer: Yes. Once. With disastrous results. For some reason, the muse reared her head again the other day. I had watched an old episode of David Letterman’s “Late Show” where they rolled out the “Will It Float” bit, and I couldn’t help it. “Will It Fly” just seemed natural. This time, aside from being quite literally covered in tiny little green specs of Shamrock Shakes, the results were a little better. I didn’t blow the launcher up. I didn’t shoot myself with anything, I call it a win.